"Flamenco is not about the notes. Flamenco is about the compás"
Ricardo de Cristóbal is a master Flamenco guitarist with over 50 years experience in his art. He was a guitarist of only several years experience when a chance visit to The Spaghetti Factory, a San Francisco restaurant, and a flamenco show featuring flamenco singer and dancer Isa Mura and flamenco guitarist Federico Mejia dramatically changed his life. A vivid flamenco experience led to the immediate acquisition of a flamenco guitar, and the first steps in an intense love of flamenco. Ricardo began his studies in flamenco guitar in San Francisco by sitting at the juerga table in the bar at La Bodega, trying to copy any guitarist who came by. Nino Bernardo was often there, accompanying every singer, dancer, or guitarist who happened to drop in, then playing solo beautifully. Bernardo’s flexibility, creativity, and “in the moment” style was inspirational. 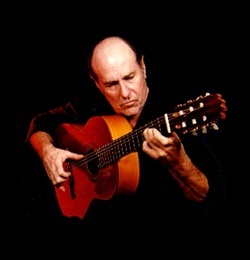 Ricardo also emulated the playing of guitarist Melchor de Marchena in recordings made with singers Antonio Mairena and Manolo Caracol.Several years later Ricardo met Cristóbal Dos Santos, a protégé of the renowned Diego del Gastor. Diego was the creator and central figure in the style of Moron de la Frontera, an improvisational way of creating continuing variations on evolving themes. Ricardo’s experiences studying cante and baile accompaniment as well as improvisational solos with Cristóbal further shaped his approach to creating music. In listening to Ricardo you will hear not only the influences of Diego and Cristóbal, but also echoes of many great Flamenco guitarists from Ramon Montoya to Paco de Lucía. The burning aire of Melchor is everywhere and Ricardo’s flamenco heart bleeds through everything he plays. You will find Ricardo performing at a variety of venues throughout the greater Phoenix area, as well as for many private functions. In addition to performance of traditional styles of Flamenco, Ricardo composes original music in a fusion of Flamenco, classical and jazz styles. Ricardo reads music when necessary, but prefers to learn, teach, and compose by ear and eye.